Ubud Art Market is one of the must-not-be-missed sites in Ubud, Bali. Exploring Ubud seems to be incomplete without coming back with the goods of this market. 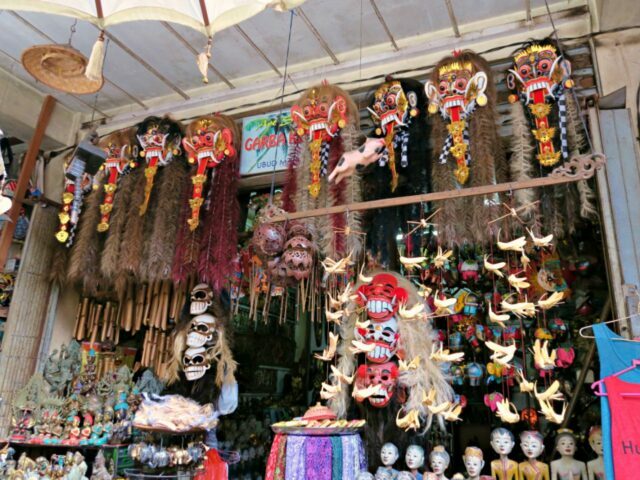 The various goods sold are all unique and identical to Balinese heritage. The stores stand in a tidy streak making the place more stunning and scenic as well. 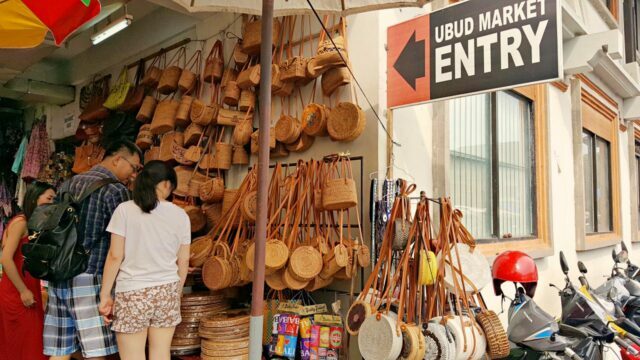 Located in the main area, Ubud street, the visitors can easily find the market across the Ubud Palace. The market is separated into two major parts of the west and the east. In the west part of the market, visitors can find artwork merchandise. Meanwhile, the east part of the market is full of groceries. Nonetheless, many of the visitors come in the purpose of buying souvenirs in the west part. After taking a step in, many sellers welcome visitors with various Balinese artworks. Some of the artworks can be worn and fit in any fashion style. Concurrently, some others are most likely to be attractive displays or accessories. Similar to other art markets in Bali, Ubud Art Market offers miscellaneous kinds of merchandise. Most of the visitors come and buy stuff for souvenirs. The eye-catching models and colors of the merchandise are what make people interested to come. Most of the visitors come with family and friends which put shopping here at best. The souvenirs sold in the Art Market are commonly handicrafts. This place becomes the center of the handcrafters around Bali to sell the crafts out. That is why the variant of the handicrafts in this market is uncountable. Not only various in types, but each of the craft types also has various colors and models. Nonetheless, still, none of the crafts miscarrying the unique concept of Balinese heritage. Most of the handicrafts are made of wood. Some of the crafts can be worn, such as caps or bags. Some others are made in a small size to be accessories, such as a keychain. Still, Balinese souvenirs cannot be separated from carving which is identical with Balinese heritage. Besides, the existence of the handicrafts is the representation of Balinese local wisdom which stands still. Along with the traditional souvenirs sold, Ubud Art Market is also a perfect site to hunt a painting. Most of the paintings show the picturesque beauty of Bali. For instance, some of the paintings show the gorgeous view of Balinese panorama and Hindu typical buildings. All of the paintings are placed in a gorgeous frame full of carvings. Recall the memorable moment of exploring the island. Buy some miniatures, temple statue, in the Art Market. Ubud traditional market offers various kind of Balinese statue. Made of stone and present in many different sizes. Make sure to bring some for souvenirs. There are also the wooden statues available if the visitors want to bring the lighter ones. The traditional wardrobe is one of the most hunted items sold in the Ubud Art Market. There are some types of Balinese wardrobe collections such as the famous Bintang shirt. Traditional Bali Sarong for child and adult. Bali traditional wardrobe has a unique design and fashionable as well. Besides, the materials used are mostly nippy and friable. The clothes are perfect to be worn on any tropical island. Ubud Art Market is also a perfect site to shop for jewelry. In this market, visitors can find many types of jewelry design for head-to-toe. Using wood and silver as the material, the jewelry popping out the Balinese character in its design. Other jewelry made of fabrics can also be found in this market. From the fiber art necklace, fabric rings to silk necklace craft. All of those types of jewelry have always been successful in showing the elegance of Balinese archetype. Not only perfect for a souvenir hunt, Ubud Market is also an excellent place to shop for Balinese snacks. In this market, tourists can find various types of Balinese snacks. The best seller snacks in this market are pie, peanuts, and pork chip. Other Balinese typical groceries such as coffee and tea are available in the east quarter. Ubud Art Market open from 06.00 am to 06.00 pm. The best time to visit the market is early in the morning. It's the right time since the market is less crowd. And seller will likely accept the bargain. See: Learn The Balinese Traditional Dance in ARMA Museum. Located in a wide area, there are a lot of stores in the Ubud Art Market which tidily stand in two parts. Explore all the lane, and start to bargain. 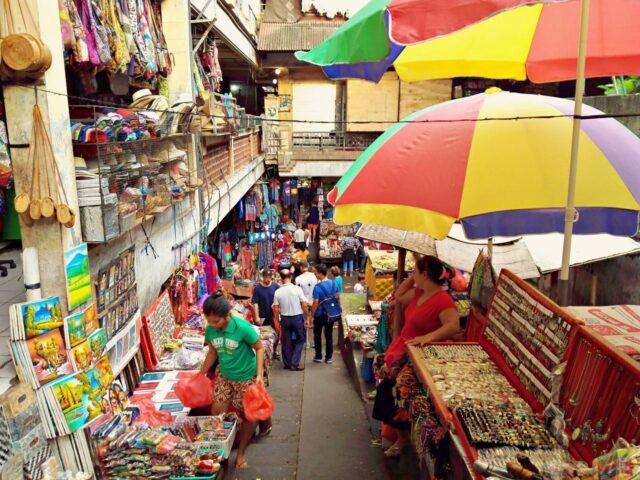 Most people walk around the entire market to find the best goods at the best prices. After all, most people will spend around 3 hours. Shopping and walk around the market. Start at least 70% off when it comes to bargain. If it didn't succeed getting the stuff. Smile politely and walk away. Some of the sellers will be very persistent but agree on 50% off price. 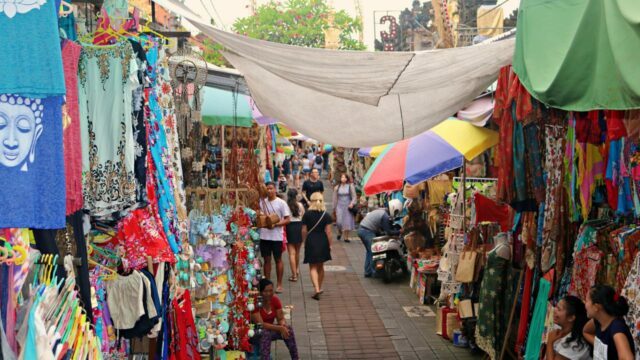 To haggle less and get a better price, explore Ubud Traditional Market early. Do the lap before the market getting busy with hordes and crowded. The sellers will easier to agree on a price in the morning. As rejecting the first customer will bring bad luck in selling their stuff the whole day. Ubud Art Market is located in the main Ubud street right across Ubud Palace. 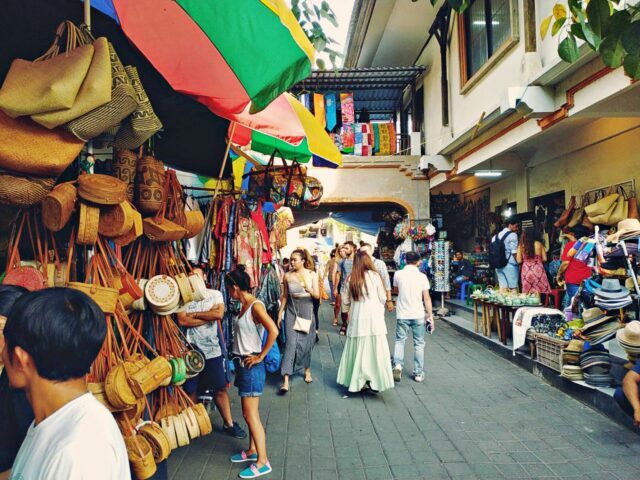 The market is easy to spot for the visitors staying at Ubud. From the downtown Kuta or Seminyak area. It takes 1 and half hour to reach the market by private car. The traditional art market is located in the main street of Ubud No. 35, Ubud, Kabupaten Gianyar, Bali 80571.